Yesterday I wrote about a $20 chardonnay that I just wasn't into from Lenz Winery. Today, I'm going to tell you about another chardonnay that they just released that shows much more balance, elegance and overall quality. And, it's only $5 more. Yes, I think you’ll do well to upgrade to the Lenz 2005 “Old Vines” Chardonnay ($25), one of Long Island’s better values in barrel-fermented chardonnay. It’s debatable whether or not any vines on Long Island qualify as old — I think these vines are still less than 30 years old — but that’s a discussion for a different time. The barrel influence is more understated here than in the Gold Label, bringing spice, fig and vanilla nuances to ripe pear and apple aromas. The palate is well balanced, with pear, apple and citrus flavors accented by just a little golden raisin and fig. Medium-bodied and with a understatedly creamy mouthfeel, the acidity is very nice here, unlike many other 2005 chardonnays I've had. The finish lingers nicely too. This white paired exceptionally well with the turkey pot pie Nena made with Thanksgiving leftovers last weekend. of purple clusters pregnant with the future. Almost a year ago, a few days after Jackson was born, I found myself on Edgewood Avenue in St. James as I was driving back to the hospital. It's a well-traveled road but not one that I'm on that often. I remember looking to my left and seeing what I immediately recognized as a vineyard. A vineyard that I hadn't noticed before. With all that was going on, I didn't really follow up with it. It's across the street from Borella's Farmstand and Greenhouses and figured I could call there to get the scoop. I just never did. A new born will do that to you. But earlier this week, a co-worker who knows about this blog pointed this story out to me, which brought it back to the front of my mind. I'm still working on talking to the owners themselves, but I've learned that the wines are being made at Lenz Winery. Two things stand out to me about this story. First, calling this the North Fork, is a bit silly and probably qualifies as unfairly benefiting from the name the North Fork has begun to make for itself. I can't imagine that they are going to be allowed to bottle under the official North Fork of Long Island AVA. And two, at $360 a case, that means this first chardonnay is going to be at least $30 per bottle. That's pretty pricey for a brand-new producer without a track record. It looks like it will be released sometime in 2008, so we'll find out if it's worth that chunk of change. I'll tell you about my favorite of the Lenz Winery chardonnays tomorrow, but today let's focus on one that I didn't like as much. Actually, I've never cared for winemaker Eric Fry's Gold Label Chardonnay much, and his 2005 release ($20) is no different. It’s definitely made in the California style that is – thankfully – losing popularity among most wine drinkers. It's medium-dark gold in the glass with a lot of oak on the nose, coming across with toasted marshmallow, sweet oak, and faint caramel aromas. There’s also some roasted apple there, but it’s subservient to the domineering oak. The fruit and oak play more equal roles on a lush, fuller-bodied, mouth-filling palate, though. Apples, pears and just a little citrus are joined by more vanilla, a creamy mid-palate and just barely enough acidity to keep it from being flabby. Is it in a California style? Sure, but it’s an above average, well-made version. It's just not the type of chardonnay I'm ever going to reach for with dinner. I don't eat oysters, but I find their place in history fascinating. I read Mark Kurlansky's book on the topic a while back and really enjoyed it. I was doing some research on Pipes Cove Oysters yesterday (because Palmer Vineyard's is making a 2007 chardonnay to pair specifically with them) and stumbled upon The Oyster Guide by Rowan Jacobsen, a terrific website for anyone who is interested in this famously raw bivalve. "...oysters owe much of their flavor to terroir, the specific environment in which they grow—indeed, oysters are the food that tastes most like the sea. Today, there are at least two hundred unique oyster appellations in North America, each producing oysters with a distinct and often dazzling flavor." I know that I, for one, had never thought much about appellations for oysters, but it does make perfect sense. And, as the winter oyster season approaches here on Long Island, I thought some of you might find this site a good read. Jacobsen also has his own book on oysters that came out a couple months ago. I need to see if I can get my hands on a copy. 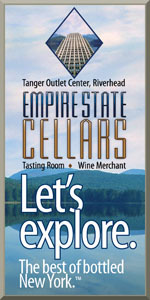 Most of my blogging focuses the wines of New York State. They are wines that I'm more excited and passionate about and you know that I drink local whenever possible. But, there are interesting and delicious wines being made throughout the United States and Canada. There are even a few in California. And it's time that I start to explore those a bit more as well. And, because I've signed on as a guide for Appellation America's Wine Explorer Society, I have a vehicle in which to discover wines from all the off-beat and up-and-coming North American regions. The Wine Explorer Society is a free-membership online community where you can discover and even acquire wines from throughout North America. I'll be scouring the entire continent to find the best, most unique wines from wineries you probably haven't heard of yet — and sharing them with you in a bi-weekly newsletter. You won't be reading about characterless, mass-produced wines from California either (but you knew that already, right). Instead I'll be introducing you unusual varietals, lesser-known regions, down-right obscure wines that I'm enjoying at home. I'm already planning to explore Michigan riesling, Virginia viognier and the wines of Texas and Colorado. If that sounds like something you're into, sign up to be a member of my Wine Explorer Society today. Membership is free and there's a great rewards program, where you can earn points for future purchases. It's all about exploring new wines, and your Wine Explorer Passport is your ticket to discovery. Sign up today. Like I said, it doesn't cost you anything. It's something I'm looking forward to doing. 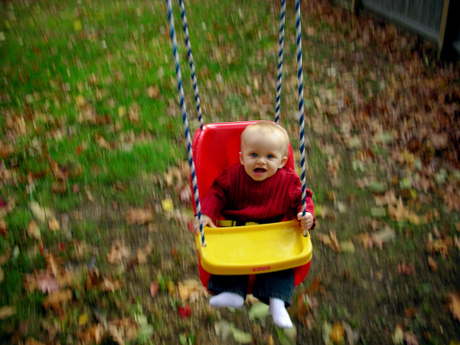 Most years, it's not really warm enough for a 10-month old to be outside in his swing without a coat on Thanksgiving, but this year it was in the high 60s, so we spent a little time outside. Jackson didn't care for the turkey much (even after a trip through the food mill with some mashed potatoes) but he did enjoy some winter squash puree. That's seasonal, no? Once again, a Wine Blogging Wednesday roundup has been posted and I didn't realize it. For WBW #39, Brooklynguy wanted us to check out "Silver Burgundy" and it looks like plenty of people found delicious wines. Mine was only okay, but it was still fun checking out a region that I know very little about. And, Sonodora over at Wannabe Wino has announced the theme for WBW #40. She wants participants to check out Petite Sirah, a varietal that I dig and think I'll actually be able to find a good representation of. I mentioned last week that I was thankful for Eric Fry and his local bubblies. As coincidence would have it, I tasted one of those very sparklers over the holiday weekend. Lenz Winery has garnered quite a bit of praise in the press by taking on high-end Bordeaux wines in blind tastings. Just this past weekend, Lenz hosted one such event where they poured 2001 Chateau Petrus, 2001 Peby-Faugeres, 2001 L'Evangile, 2001 L'Eglise Clinet, and 2001 Lenz Old Vines Merlot. I'm not sure that Long Island wine will get where it can go by constantly comparing itself to Bordeaux, but it's worked well for Lenz so far. What gets lost in all of these red wine-focused tastings is the quality of Fry's sparkling wines -- he truly is Long Island's Baron of Bubbly. The Lenz 2001 Cuvee, a new release, is made with 70% pinot noir and 30% chardonnay. It features a fairly persistent mousse and fine bead. The aromas are clean and fresh with fresh pear, apple and cherry aromas and a faint, doughy yeast note. Dry and lively, there is loads of apple flavor here with white cherry, dried cranberry and yeasty, toasty complexity. The delicious finish features with a crisp citrus note that definitely invites another sip. Think oysters. Think fried foods. Think every day drinking. Bubbly doesn’t need to be reserved for celebrations. It creates them. And, for all of you New York Cork Club members out there, you just might be getting a bottle of this in December. Rating: (3.5 out of 5 | Very good-to-Delicious). Well, I just finished my third or fourth round of stuffing turkey, stuffing, mashed potatoes etc. down my throat over the past two days...because it's so delicious. The Turkey. Amazingly moist and with a texture that I'd describe as almost succulent. I wasn't sure what to expect from our first Bourbon Red, but the flavor, texture and moistness has sold me. Plus, I know where the turkey was raised, who raised it and how it was raised. The Stuffing. I think I want to eat my wife's stuffing every day. The Pies. Yes, plural. Nena made a pumpkin with local cheese pumpkin. I dare call it the best pumpkin pie I've ever had. The apples in the apple pie didn't quite cook down as much as she'd hoped, but the crust on both pies are her best ever. Each of the last three times she's made pie crust it's gotten better and better. I can't wait for the next batch. The Riesling. Decided to open a bottle of Fox Run Vineyards 2005 Reserve Riesling and was blown away. Impeccable balance of citrus, faintly tropical fruit and minerals...all with terrific acidity. I wish I had a few more bottles in my cellar. The Pinot Noir. Went with one of my last two bottles of Wolffer Estate's 1998 Pinot Noir and I'm not sure how much more time the last bottle has. Extremely earthy -- as in wet earth and mushrooms -- the acidity and silky texture are stil, but most of the fruit is gone. I like my wines dirty like this. Nena doesn't. I ended up drinking much of the bottle of the course of the night and will probably finish it tonight. That's the quick version. I've got lots of wines to taste over the weekend, so look for more tasting notes soon. I know that I've not posted many lately, but they're coming. It's before 7 a.m. and the LENNDEVOURS household is awake and hard at work. Nena actually kicked off the Thanksgiving last night by making her first of two pies using some roasted local cheese pumpkin. She's cutting up apples now for pie number two and then we'll move onto the savory items for the day. I've still got some "What XXXX has planned for Thanksgiving" to post...so look for them later today. In the meantime, happy Thanksgiving from our family to you and yours! This is a list of just some of the wine-related things I'm thankful for this Thanksgiving season. Feel free to leave comments about the things you are thankful for this year! The 2007 Harvest. Just like the local winemakers who can't stop talking about the healthy, ripe fruit they've been given to work with and the local wine lovers who will enjoy the result of that work, I too am thankful for the 2007 season. It promises to be one of the best vintages ever. That means I'll have plenty to write about for years to come. Small Producers. I'm thankful for the tiny, family-run wineries that may only make a few hundred cases each year. Their intrepid energy is inspiring and their wines can be as well. I'm talking about places like Medolla Vineyards, Scarola Vineyards, Diliberto Winery and Waters Crest Winery. Thank you for keeping the family in family wineries. Eric Fry. The merlots Fry crafts at Lenz Winery have matched First Growth Bordeaux in blind tastings, but I'm thankful for the sparkling wines he makes for Lenz as well as for Lieb Cellars and The Old Field. Bubbly is great any time of year, but they seem to find their way into our glasses more this time of year. Cheers! The Experimenters. Of course wine is a traditional product, but it's always great to see innovative and new ideas applied to it. Like Paumanok bottling some of their 2007 vintage under screwcap closures. Martha Clara Vineyards making their first Syrah-Viognier blend in the tradition of the Cote-Rotie region of France. Palmer Vineyards creating a chardonnay meant to pair specifically with Pipes Cove Oysters. And, of course all of the unique, interesting blends and techniques being employed by Chris Tracy down at Channing Daughters Winery. Grapes of Roth. Winemaker Roman Roth's private label has already given us one of the region's best merlots. But, the German-born winemaker will add a riesling to the portfolio this spring. It's a wine I'm very much looking forward to. Local Cabernet Franc. Merlot still gets much of the press in these parts — and deservedly so. But I'm absolutely and hopelessly hooked on local cabernet franc. The best ones bring together fruit, earth and herbs — all with just enough structure. Look for varietal bottlings by Raphael, Pellegrini Vineyards, Opsrey's Dominion and Wolffer Estate. The cab franc-heavy blends from Roanoke Vineyards show the grape off well too. My Readers. Over the past year or so, I've had the opportunity to meet more of you than ever before. It's always great to meet people who are as passionate about wine (local or otherwise) as I am and I hope to meet many more of you in the coming year. 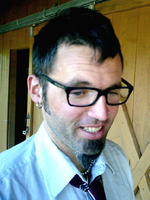 We continue our tour of contributor's Thanksgiving plans with Robin Meredith, our newest contributor. As with many Americans, our Thanksgiving is a "melting pot" affair, with at least four family groupings, three generations, and two major ethnic groups gathered around the table. The menu is usually fairly traditional but, needless to say, beverage preferences vary pretty widely in a group like that. Of course, Karen and I are always expected to bring the wine. We usually tend to focus on crowd-pleasing wines with some local flavor -- this is not the occasion to break out the Corton-Charlemagne! I always tend to think big bottles have a nice celebratory feel, so this year we'll be bringing a magnum of the 2002 Comtesse Therese Traditional Merlot (a gift from Theresa Dilworth -- thank you Theresa!) and one or two magnums of Macari's 2002 Merlot (an exceptional wine that was still available in magnum at the winery as recently as last summer). Most of our crowd prefers reds, but I am partial to whites with the Thanksgiving meal, and I usually try to sneak in one or two special bottles and make sure they land on my table. This year I have my eye on a 2004 Cour-Cheverny Cuvee Renaissance from Francois Cazin, an absolute beautiful rendition of Chenin Blanc with just a touch of residual sugar to help it stand up to the food. 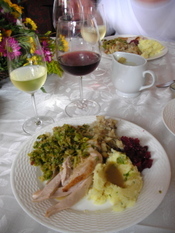 Alsace is another great choice for Thanksgiving -- the 1998 Cuvee Frederic Emile Riesling from Trimbach is drinking beautifully right now, although it is a bit on the dry side -- just have to keep it away from the candied sweet potatoes and cranberry salad! This year we’re headed to my sister-in-law’s place in Livingston, New Jersey. Her husband is a former chef who trained at the CIA, so we’re in good hands. I don’t love turkey, but he brines his bird, which is definitely an improvement. Sides are mashed potatoes, mashed turnips, and, yes, the green bean casserole from the back of the cream of mushroom soup can. It’s a tradition in my husband’s family, and not one I embrace. Fortunately, my husband’s also making the cornbread, broccoli rabe and Gruyere strata that was in The New York Times last week – his family is Italian-American, so while it might not be a traditional dish, it’s definitely appropriate. I just received Alice Waters’ The Art of Simple Food cookbook as a gift, and while I think she sometimes takes the organic/local/seasonal thing to impractical extremes, I’ve never had anything but success with her recipes. She has a great-looking one for Cranberry Upside-Down Cake, which, at the very least, gets me out of making a pie crust. To loosely paraphrase the British wine merchant Harry Waugh, the first duty of a Thanksgiving wine is to be American. I believe in saving French, Italian, Australian, and German for the other 364 days of the year. I also like to choose wines that are a bit unusual, if for no other reason than to serve as a conversation piece at the table. But I don’t want anything so unusual as to be off-putting -- Thanksgiving is not the time to test your mother-in-law’s tolerance for brett by pouring a barnyardy Syrah. For the white, I’m bringing a 2006 Torii Mor Willamette Valley Pinot Gris. Pinot Grigio tends to be the family fallback white, so I’m hoping the Torii Mor will show that this varietal can make much more exciting, full-bodied, and aromatic wines than they may be used to. (And higher in alcohol -- the Torii Mor weighs in at 13.8% -- not necessarily a bad thing at the holidays.) As for the red, I wanted to go out on a bit of a limb and select something I’d never tried before. My wine store in Brooklyn stocks several Charbonos, an impressive feat given that there’s under 100 acres of the varietal planted in the U.S., primarily in Napa. According to the Oxford Companion, it’s identical to Corbeau, an all-but-extinct grape that hails from the Savoie. There’s also evidence showing it’s the same as Argentine Bonarda. And it shares a name with, but is distinct from, Italian Charbono, often cultivated in Barbera and Dolcetto vineyards in Piedmont. I’ll be bringing the Summers 2005 Estate Charbono. I’m not sure what to expect, but based on some online research and my (very limited) experience with Bonarda, I’m imagining a fruit-forward, deeply colored wine. Whatever you’re eating or drinking, I hope you have a wonderful Thanksgiving! Please join canvas Magazine and the Long Island Sierra Club for an organic wine tasting on November 29 from 6:30-9:00 p.m. at the Huntigton Cinema Arts Centre (423 Park Avenue). You can either pay at the door, or send you $25 check to Long Island Sierra Club, PO Box 210m Syosset NY 11791-0210. Morris at frankmorris@ecologicinvestor.com or 516-410-8461. A reader tipped me off to the fact that LENNDEVOURS was mentioned is Newsday today. The topic of the short piece is Paumanok Vineyards' being the first Long Island winery to employ screwcaps. I let you guys know about this back in August and I'm quoted in Mark Harrington's piece. A comment that Bill of Loving Long Island left on my original post was also quoted. I didn't know that buyers of wine futures can opt to have their wines bottled under cork or screwcap. That's a pretty interesting thing. I'm curious to hear how many buyers choose the screwcaps. One question though: is the 1% figure quoted considered accurate in the industry? I've always heard at least 5% and up to 10% of wines closed with traditional cork are corked. As I promised last week, the next few days on LENNDEVOURS will feature a look inside the Thanksgiving plans of our contributors and readers. My Thanksgiving plans will place me in a position where the choices of wine will be less than spectacular. As a guest at my in-laws, I will be subject to a choice between a mass produced, generic California wine or a mass produced, generic Australian wine. Most of these wines are not awful by any stretch, but there is nothing special about them even when they fit the meal nicely enough. They are the wines that are found at the front of the shop, cases piled high, with a big discount sign hanging above. Ultimately, wine is about enjoyment and sharing its pleasures with others. Despite the fact that my wine tastes have matured considerably in the last few years, I will never bring myself to consider the wine before I consider the company. I’m grateful that my wife’s family will generously provide what will undoubtedly be a great meal, and I will make due with any beverages that are available. My own family barely even drinks at all, and I find meals with them to be a wonderful experience. I’m thankful for my family, my wife’s family, and the time we spend together. Right now, the wine has to take a firm second place in terms of importance. Later, when our siblings grow older and we have children of our own, I’m sure we will be hosting a Thanksgiving dinner or two. These events will give me a chance to share wine in my own style. Other than my wife’s homemade apple pie, I think I will bring along a good semi-dry blush from Keuka Springs and a 2003 chardonnay from Dr. Frank’s. It is entirely possible that these bottles will be placed immediately in the refrigerator and forgotten before the meal even starts. So be it. If you're a lover of Long Island wines, the name Robin Meredith might be a familiar one to you. Robin is the former co-owner of Broadfields Wine Cellars and The Tasting Room, and a reformed wine snob who used to become paralyzed by the mere thought of having to order a cocktail. He and his wife Karen are currently living in New York City and planning their eventual move to Santa Fe, New Mexico, where they will almost certainly not be planting another vineyard. In the meantime, Robin has become completely obsessed with New York City's thriving cocktail culture. 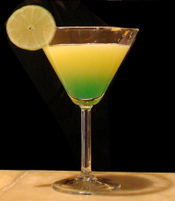 So in addition to his strategic planning work for a Fortune 1000 information solutions company, he will be reporting for LENNDEVOURS on new and exotic ingredients, highlights (and lowlights) of the Manhattan cocktail scene, classic cocktail recipes, tools, techniques and events. He hasn't completely turned his back on wine: he is currently a student in the WSET diploma and has ambitions to someday establish a wine education and consulting practice in New Mexico. Please welcome Robin aboard. Beyond bourbon with one ice cube, cocktails are something I know little about. In an email conversation with David Page, co-owner of Shinn Estate Vineyards, about their current red releases, he told me that he and Barbara have sold Home to their long-time silent partner, saying "The 15 years we spent at Home were some of the best years of our lives. 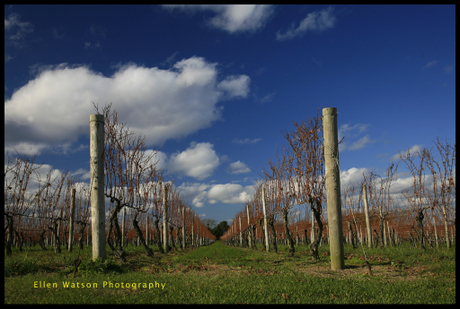 We are excited about the opportunity to give Shinn Estate Vineyards and Farmhouse our full attention." Home will remain open through the end of the year, but will then close for renovations, reopening in the spring sometime. And while there will obviously be changes, Page told me that "The new ownership is planning on bringing back the current chef and manager as well as many of the classic menu items." I've only eaten at Home once, but it was a great experience. The focus on local, seasonal ingredients shouldn't surprise anyone who knows Page, but a wine list that offers only East Coast wines is a truly unique thing in a town where it's tough to be unique. So, if you want to enjoy local food with local wine, make sure you visit home before it closes. Incidentally, I finally bought a copy of their Recipes from Home cookbook, and I look forward to trying some of the delicious-sounding recipes. A couple years ago, I did a story about what Long Island winemakers were planning to eat and drink on Thanksgiving. It was a lot of fun and certainly interesting. But this year I want to do something a little bit differently. Instead, I've asked each of the people who contribute to LENNDEVOURS to share their plans. We've got a diverse group, including a vegetarian. And I also want to know what you are planning for the holiday. Send me an email and let me know. I'll post as many of them as I get. Finding a Silver Burgundy, as this month's WBW host asked of us, proved much harder than I ever imagined. True, I didn't have time to go to my go-to shop for WBW. It's an hour from our house with traffic. But still, I stopped at two shops on my way home Tuesday evening expecting that I could find something. Strangely, if we were doing Chablis or "gold" Burgundy, I would have several options. Not so for this month's theme, however. 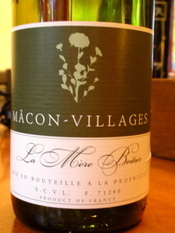 But, it was the lovely and talented Mrs. LENNDEVOURS, who found this bottle of La Mere Boitier Macon-Villages at a third local shop later in the evening. For $13.99 no less. Sadly, because we found our wine so late, and things have been hectic with a sick 9-month old here at the LENNDEVOURS world headquarters there wasn't time for a full-fledge review, meaning that I didn't taste it blind or even pull my notebook out. But that doesn't mean we didn't like it. I'm not going to pretend that it was some sort of revelation. It wasn't. But it had nice apple and citrus flavors, just a little oak that comes through as vanilla an caramel. Nice, faint hints of minerals too. Nice, but not aggressive, acidity balances the wine nicely and the finishe was a bit longer than I expected at this price point. So, overall I'd definitely drink this wine again. Nena really liked it too, so we just might be drinking it again very soon. Alice Feiring (you might know her as the writer behind Veritas in Vino) has written an opinion piece about the World's Most Overrated Wines for Men.Style.com. So I'm clicking through the piece, expecting to see Beaujolais Nouveau, maybe Aussie shiraz mentioned. I really didn't know what else would be included. "The strawberries, potatoes, and corn grown out on Long Island are world-class. But grapes? Not so much (though you've got to give local winemakers credit for their perseverance). The fact is, soils are just too shallow on Long Island and the weather's just too humid to make world-class wine, especially from Merlot and Cabernet. Of course, that won't stop your friends out East from touting their new local find—nor should it stop you from showing up for the weekend with a bottle of a better alternative." Now, I'm the first to admit that there are a lot of bad wines made on Long Island. No one can dispute that. The same can be said of any wine region, however, and the percentage of I'm not sure how much experience Ms. Feiring has growing grapes anywhere, let alone on Long Island, but for her to state definitively that the soil are too shallow is ludicrous. And too humid? Yes, maybe for thin-skinned varieties like zinfandel, which was abandoned years ago, but ocean breezes and meticulous vineyard management mitigate the risks brought about by humidity. I might not have even mentioned this story if she had only mentioned cabernet sauvignon as a grape that doesn't do well here. But to include merlot is more than a bit misinformed. Merlot ripens quite well here and leads to many of the Island's best wines. By the way, it's true that cabernet doesn't always do well here, but it has little to do with soils or humidity. It has to do with heat and sunshine. A lot of the time, it doesn't ripen fully -- at least by Napa standards. 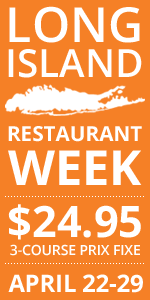 Maybe Long Island would belong on a list like this one if there was some mention of wine prices or perceived value. Long Island wines aren't cheap. At least the good ones aren't cheap. Value is a tougher descriptor to pin down, but I think there are some great values in the $25-40 range. But there isn't any mention of prices in Ms. Feiring's piece. My guess is that Ms. Feiring hasn't tasted very many Long Island wines -- or at least a fair, representative number of the region's best. And she's also ignored the fact that Long Island is still a very young region. And, to be overrated, doesn't that mean that you have to be rated highly by a lot of people? I rate Long Island wine highly, but Long Island is still up and coming in most wine circles. Aside from Long Island, there are a few entries that I would agree with if I thought broad generalizations like these made any sense. She includes Aussie shiraz, as I expected, but to say that all Aussie shiraz is overrated is ignorant. The same is true for her inclusion of Chilean cabernet, and others. "...when compared to the Old World original stands up neither in terms of price nor quality. Our advice: Grab a bottle from the Loire Valley, where diverse microclimates and the yellowish limestone soil give wines real nuance." I happen to prefer Loire sauvignon to Kiwi renditions too, but that's a stylistic preference. Lots of people prefer the aggressiveness of Kiwi sauvignon blanc and find Loire whites boring. Does that really mean that they are overrated? Alice, I'd like to invite you to come out to Long Island wine country this winter and taste with me. Perhaps being a Long Island native you are remembering the wines from the 80s and early 90s. Come taste with me and we'll find some wines to enjoy together. Maybe you won't find anything you like. Maybe you will. But at least we'll get the region's best to your lips. Oh, and since when are strawberries a crop that Long Island is famous for? Potatoes and corn yes. But strawberries? The Mattituck festival aside, I think there are other, more famous, crops. Thanksgiving Wines: Stop Stressing. Drink Local. I haven't written about it much lately, but I'm still the wine pairing guru over at the Culinary Media Network (formerly Gilded Fork). Jen and Mark are terrific and supremely passionate about what they are doing. Between the website and the podcasts, there is plenty of food and drink information coming out of the network. Why do I bring this up as part of my LENNDEVOURS Thanksgiving wine column? Well, when Chef Mark sent me his Thanksgiving menu so that I could start working on the pairings, it really hit me: Why do we worry so much about Thanksgiving wine pairings? Just like most Thanksgiving Day menus, Chef Mark's is diverse with a bounty of flavors and textures: You've got the richness of the Lemon-Herb Mayo and the Pumpkin Bisque, as well as the tenderness of the turkey, the spicy-sweetness of the carrots and the sweet-tart flavors of the cornbread. Every year, you'll see (without fail) hundreds of articles lauding this wine or that as the "perfect" or "ideal" match for Thanksgiving dinner; but if you read enough of those stories, you'll see just about every variety/blend from just about every wine region in the world mentioned. What does that mean? It means that you shouldn't buy into it. And you certainly shouldn't stress out about it. As I was pondering this menu, I could easily have offered individual wines that I think would pair nicely with each item; but will each dish be served alone, without any of the others? The soup might. As might the dessert. But you'll probably be eating the rest of the stuff at once -- on one plate, at one time. I don't know many people who have Thanksgiving dinner as a coursed meal. I know that in my family, it's a family style free-for-all. That all said, versatility is important here. Pinot noir might work, as might good, dry riesling. A dry rosé might even work well. 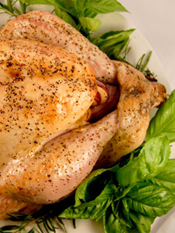 And of course a well-balanced chardonnay is classic with poultry. But you know what? Don't listen to me. Listen to yourself. What do you like? What wines are you enjoying right now? Maybe even as you read this blog post? DRINK LOCAL. Thanksgiving is a holiday that gives us the opportunity to think about all the things we are grateful for in our lives; it's a celebration of our local bounty, and too often people forget that there is wine being made in every state. So drink local, American-made wines on this most American of holidays. Drinking local is just as important as eating local: By supporting your local wineries, you're preserving agricultural land that could easily be converted into condos or commercial real estate. You're supporting the hard-working vineyard laborers, the winemakers and everyone else involved in the crafting of wine. I'm thankful to have Long Island wine country in my back yard, so I'll honor and thank them this Thanksgiving by drinking their wines with my locally raised, free-range Bourbon Red turkey. And you know what? I'm not sure what I'll be drinking yet. I'll figure it out. But I can guarantee you that it'll be local -- and it will be delicious. 2007 Harvest the Best Ever for Long Island Wine? Was the 2007 harvest the best ever for Long Island wine? Mark Harrington of Newsday seems to draw that conclusion in his piece today after speaking to a large group of local grape growers and winemakers. I'm working on my own harvest-end report for my East End Oenophile column for Edible East End's winter issue, but this is a great overview. Harrington should be applauded for asking a variety of industry members rather than just the same old people. He also admits that winemakers and vineyard managers almost always laud the latest vintage, but it does feel different this year. I actually believe people when they tell me that they've never seen anything like this before. So check it out. I should have my story done in the next week or so. I'm asking a few different people for their insights and have asked about global climate change and it's affect on local wine. I don't think, however, that David and Barbara up at Shinn Estate have been growing grapes for a decade, have they?